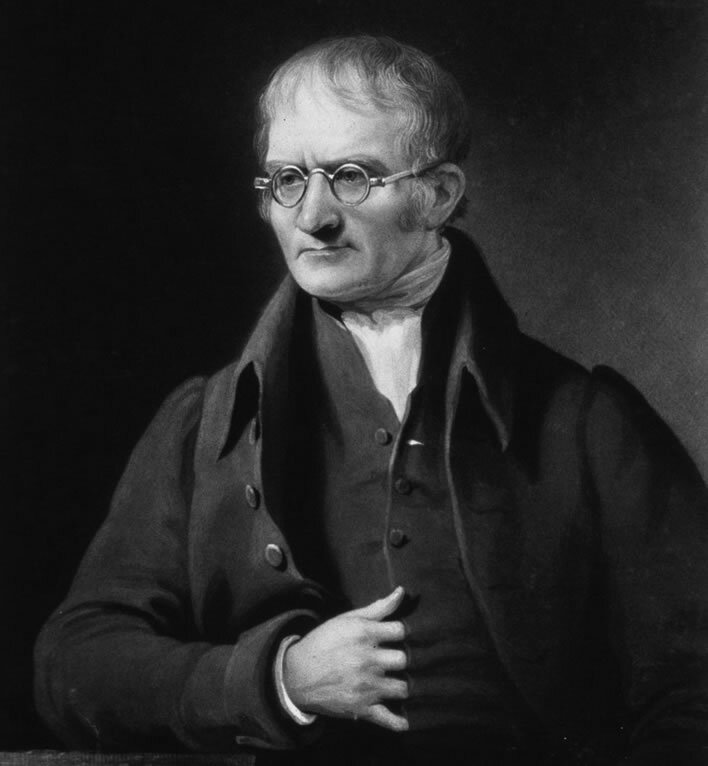 Late to the party as usual (only a month out, though) we note that the 250th anniversary of the birth of John Dalton (1766-1844) fell on 6 September. We are not historians of science on this blog, but we believe that this major anniversary of Dalton's birth went insufficiently noticed in more important places. John Dalton in a mezzotint by Charles Turner (1774–1857) (1834), from a charcoal sketch by James Lonsdale (1777–1839) made from the life in 1825. Image: United States Library of Congress. James Lonsdale's original 'hangs in the office of the Director of Planning and Academic Services, University of Manchester', so you will have to go there to see it. Knock and ask politely. Dalton was brought up a Quaker. He exhibited all those remarkable Quaker qualities of modesty, independence of mind and, above all, industriousness that we noted, in our piece on Max Weber's Protestant Ethic, as being crucial to the development of the modern world. His curiosity about the mysteries of the physical world around him – be it his own colour blindness, or weather phenomena or the structure of the English language – was the curiosity he shared with all the great thinkers of his time. When Dalton was born, chemists such as Archduke Leopold were messing around mixing stuff together ('stuff' is the accurate term here) according to some idea of 'affinities' in the hope that something useful might come out. Those who survived the mixing process might then roll the dice once more by heating it up and seeing what would happen. Most survived the toxic vapours that were frequently given off and the explosions that took place. Some didn't. By the mid-point of his life in the early 1800s Dalton had succeeded, by careful reasoning and measurement, in founding the atomic theory of matter (and many other things, too). Nowadays we have an easy familiarity with words such as elements and compounds, atoms and molecules. In Dalton's time this was – well – revolutionary, a fact that his contemporaries recognised immediately. Dalton's atomic theory was one of those few leaps that took man from knowing next to nothing in a particular field to knowing, in essence, almost everything. If anyone can claim to have brought humanity from the shadows and unknowns of the age of alchemy into the light of the modern understanding of the nature of matter, it is Dalton. He was not the only one active in the field, not the only genius, but his contribution was immensely important. Once pointed in the right direction, it would take science only one century to go from Dalton to Mendeleev, Thomson, Rutherford, Planck and Einstein – too many to mention – and another half-century to get to quantum mechanics. In this sense, therefore, the 250 years from Dalton's birth to the present day are not just some interesting calendar fact but a measuring rule applied to the progress of the Scientific Revolution. Well done, that man!